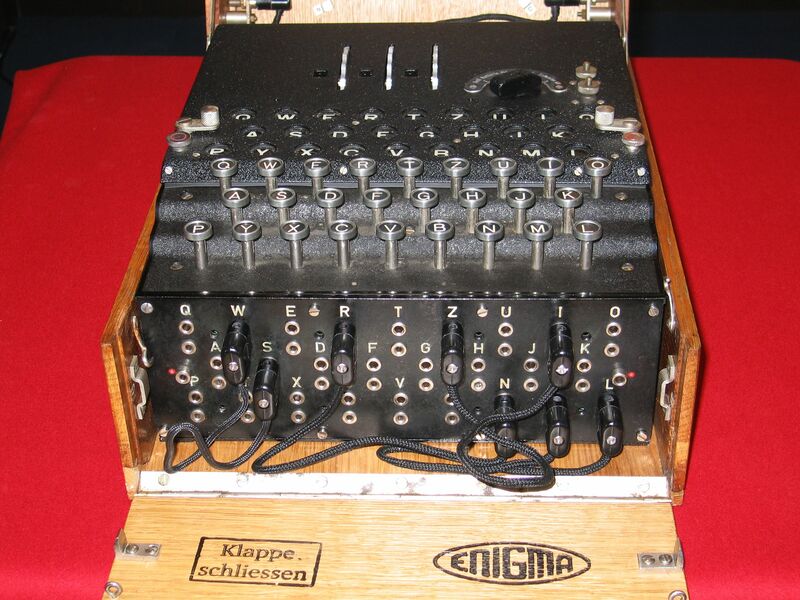 [Back] The Enigma machine was used in the War where operators re-configured the machines every day with a code book (or key sheet). Each key sheet contained defined the daily Enigma settings over the period of a month. Each day the machine was reconfigured. The Enigma machine was used in the War where operators re-configured the machines every day with a code book (or key sheet). Each key sheet contained defined the daily Enigma settings over the period of a month. Each day the machine was reconfigured. There is also a reflector setting which is normally fixed and does not change in the field. When receving a cipher text, the first thing to do is to determine the day that the message was set so that the key can be determined. The date uses the Kenngruppen (text fragments) to determine the date it was sent, and generate the correct key set. Day 1 uses II-IV-V, and rotor rings of 1 16 10, and a mapping of "AV BS CG DL FU HZ IN KM OW RX" and Reflector of "B". Day 2 uses I-IV-V, and rotor rings of 1 15 10, and a mapping of "AC LS BQ WN MY UV FJ PZ TR OK" and Reflector of "B".